Discussion in 'Lighting and Electrics' started by SanTai, Apr 5, 2019. I found this cable which looks dangerous. Is there any setup where it might be legal and kosher to us? Such as both 32A plugs go into one PDU each. No idea what electrical code is like where you are, but in the US you need a breaker anytime you step down from a higher rated circuit to a lower rated circuit. If so, how many contacts are on each of the connectors?? Is this possibly a 3 phase male 63 Amp connector feeding two 32 Amp female connectors? Is this possibly two 32 Amp male connectors feeding one female 63 Amp female? In any case, on our side of the ocean we'd require fusing or circuit breakers to change connector amperage ratings and the fuses or breakers would need to be sized to protect the wire gauges in use. It is 3 phase CEE connectors. 1x63A feeding 2x32A. As far as I know it should be illegal hear and most likely in most parts of the world. However I imagined that there might be a strange exception while feeding 2 PDUs with 32 A breakers or something. But my assumption is that it is illegal and dangerous unless anyone can prove a safe and legal use for it. @SanTai I wondered if it was possibly one three phase male being broke out to two single phase females but we'd still require fusing or circuit breakers on my side of the ocean. Trust your instincts. I certainly won't claim to know anything about Swedish codes, but typically you are required to have a breaker or fuse before the transition to a smaller gauge wire or lower-rated connector. The breakers in the PDU in your example don't do any good to keep the wire in between from melting in the case of a fault. 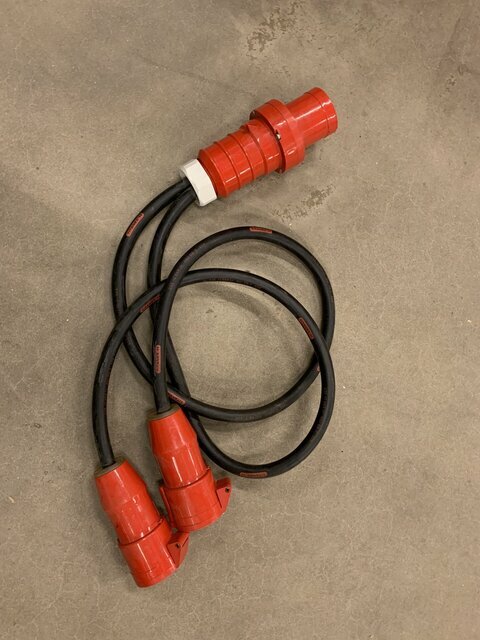 The US National Electrical Code does have some very specific exceptions for permanently installed wiring, but the section on portable stage equipment clearly says that you cannot adapt from a higher current connector/cable to one with a lower rating. Everything in line has to be rated for the full current of the breaker feeding that circuit. if it is, they are using the wrong Cees. Is it impossible that the *wire* in both sides of the tail is actually rated for 63A? That would meet code, no? It's possible that the wire is so sized, though I kind of suspect it's not. Even if it were, I don't believe it would meet code because the 32A connectors are being fed by a 63A source, even though there are two of them. If only one is in use, it would be entirely able to be overloaded to twice its rated capacity without tripping a breaker or anything. That's a fairly common sight in the UK, strain relief on the connector may not be good, but if it is this 100% safe when used alongside competent technicians. @AidyJ This reads like equine excrement to me. @Jay Ashworth @dvsDave @TimMc @TimmyP1955 @egilson1 and @derekleffew plus @ruinexplorer Care to comment??? @AidyJ This reads like equine excrement to me. @Jay Ashworth @dvsDave @TimMc @TimmyP1955 @egilson1 and @derekleffew Care to comment??? First off, nothing in this world is 100% safe. And this adapter has the potential to be no where near 100% safe. So now we've got 63A flowing through a 32A rated piece of cable for an hour before anything ever thinks about tripping. That can easily start a fire. Now the risks are somewhat mitigated if you can be absolutely certain that the piece of equipment or distribution on the other end has a 32A breaker on its input. But that would not typically be a compliance requirement in most jurisdictions. In ABSOLUTELY controlled load environments, yes its use can be "safe enough", and I've been in a situation like that with somewhat similar adapters made for a particular gig, but whether your insurers or occupational health and safety regulators would also agree on it being safe enough is another story. As a general rule, there are too many ways that a sensible, trained individual could cause issues with this device if they are not intimately familiar with its particular use case and able to work within those parameters. I agree, in the UK typically every distro has an MCBO. With intelligent staff which Ron makes it sound like you don't have this won't be an issue. As long as the required technical staff know what power is going where then then I cannot see there being an issue. The thing is, at least in Aus, there is no requirement for a distro to have an input breaker. It's quite compliant to have 4 or more 10 or 20A breaker fed from 1 32A inlet. If these are all loaded to capacity, you have exceeded your input rating and are relying on the upstream protection to handle that. In the UK and perhaps elsewhere, an OCPD is built into the plug if the item to be powered has a smaller conductor than the supply outlet... at least that seems correct for household items. I don't know much about electrical regulations outside the USA so I'm not qualified to comment further except to say that in the USA, using such an assembly would likely be a Code violation.